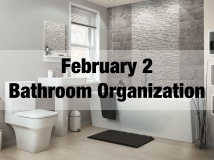 To celebrate Get Organized Month this month, we are doing a video series to take you through your home and teach you how to organize those spaces. This week, we focus on organizing your living areas. Feel Overwhelmed? We can help. To enter, post your before and after photos on Facebook in the comments below the video or email them to us so that we may post them at info@psorganizing.com. By doing this you give Practical Solutions permission to post them (using your first name only) and to judge the contest. Each individual who participates by posting their before and after pictures receives a 5th hour free on any 4-hour organizing session at our promotional price of $300. Call Practical Solutions at (909)307-4862 to schedule your session and receive your free hour. Session must be used before March 15, 2019. All posts will also be automatically entered to win the grand prize of a 4-hour organizing session. Four-hour session must be used by April 15, 2019. Participants must be located in our service area in order to qualify for 5th hour free or 4-hour organizing session. Call (909)307-4862 if you have questions about our service area. Participants may use the help of one of our organizers to complete the project. All pictures must be submitted by midnight PST on February 9, 2019. The winner will be announced on February 11, 2019 at 8:00 AM PST. I hope today’s assignment was helpful. If you feel overwhelmed by the assignment, please give us a call for a free assessment where we discuss your needs and determine if having the help of an organizer would be beneficial for you. Whether you do it yourself or with the help of one of our organizers, make sure you take before and after pictures, post those on Facebook in the comments below or if you are not on Facebook you can email your pictures for us to at info@psorganizing.com. Everyone who shares their photos will receive a free hour when they purchase at 4 hour organizing session at our promotional price of $300. They will also be automatically entered to win the grand prize of a 4-hour organizing session. For contest rules, please visit us online at psorganizing.com or click the link below.